The Work Progress Administration built the brick school in Hext in the 1930’s. Kathy Weiser-Alexander, November, 2005. 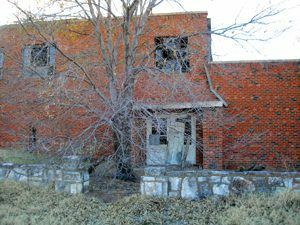 As you continue your Route 66 journey to the Texas line from Sayre, Oklahoma, you will pass by the ghost town of Hext, established in 1901. This farm and ranch community was never very big and only supported a post office for about a year and a half — June 4, 1901 to November 29, 1902. The town was named for William Hext, a local farmer. There was once a stone gas station here that was later converted into a home and the pumps were removed. In fact, when Jack Rittenhouse wrote his Guidebook to Route 66 in 1946, he noted that Hext was “Not a community — just a gas station.” However, the town did sport a fairly large brick school that was built by the Work Progress Administration in the 1930’s. The abandoned school still stands though deteriorating quickly. Other abandoned and falling buildings can also be seen in the area as well as several segments of original Route 66. The only building that is not abandoned is the Hext Baptist church. This stretch of old Route 66, between here and Erick, was the last in Oklahoma to lose its US 66 designation to superhighway I-40. Erick, known as the “Gateway to Oklahoma,” was once the westernmost city of the state due to surveying disputes with Texas. Getting its start in 1900, the town was first called Dennis when a post office was established in February, 1900. Primarily formed as a farm and ranch community, the area was first known for the many cattle drives that passed through, stopping at old Salt Springs southwest of Erick. Nature’s gift to these early-day cattlemen, the fresh-water springs made an ideal stopping off place during the late nineteenth century. Later when the Choctaw, Oklahoma and Gulf Railroad line made plans to come through town, the Choctaw Townsite & Improvement Company filed an application for a townsite of 80 acres. The post office name was changed to Erick in November, 1901 after Beeks Erick, one of the developers. The town incorporated the same year. Until Beckham County was created at 1907 statehood, Erick was located in northern Greer County. At this time, Erick had a population of 686 people. By 1909, the town boasted 13 general stores, two hardware stores, several cotton gins, blacksmith shops, a livery, a harness shop, and a lumber store. Food could be purchased at five meat markets, several grocery stores, a bakery, and a confectionary. The town supported two banks and two weekly newspapers — the Beckham County Democrat and the Erick Altruist, as well as three churches. In 1910, its population had grown to 915. By 1920, it boasted 971 people. That would change quickly when oil was discovered in the 1920’s quickly increasing the population to its peak of 2,231 in 1930. The town hoped to become another Oklahoma boomtown, however, these hopes were dashed when the oil was not a plentiful as they had hoped. The population dropped in the 1930’s but Erick persevered with six cotton gins, an ice factory, and entrepreneurs manufacturing salt from the nearby salt springs. At this time, there were 22 teachers in the schools who were serving 956 students. Though the town prospered in the post-war travel along Route 66, it was in the 1940’s that it began to decline. In 1940 Erick had a population of 1,591 and by 1970, it had been reduced to 1,285. 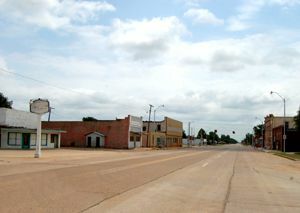 The town suffered yet another blow when the four lane section of Route 66 from Sayre to Erick were the last in Oklahoma to be bypassed by I-40, in 1975. 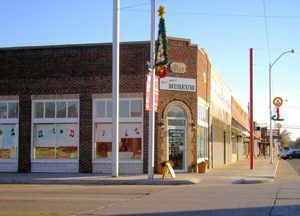 Roger Miller Museum in Erick, Kathy Weiser-Alexander, November, 2008. In 1980, Erick rebounded a little due to renewed oil and gas drilling and the population increased to 1,375. Today, this small town is called home to some 1,052 people. Though Erick is far from a ghost town many of its downtown brick buildings and businesses along Route 66 sit empty and silent, speaking of better days.